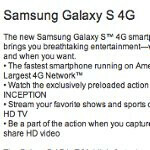 In yet another move to slowly indicate that it’s coming, T-Mobile’s site now has a “Coming Soon” page up and running for the Samsung Galaxy S 4G. 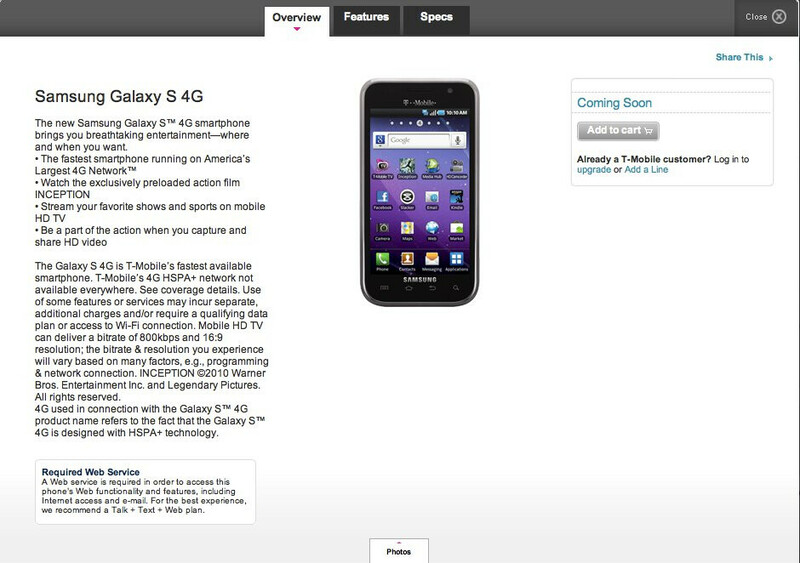 Similar to what we see with other handsets, the arrival of a “Coming Soon” page clearly indicates that an eventual launch isn’t too far off in the distance. With MWC right around the corner, you know that this one will undoubtedly get the full unveiling treatment – with a release close at hand. So far, all eyes point to February 23rd as being the day when we’ll all see this next-generation Android powered smartphone. Upon checking out the site, some might be thrilled to see the “add to cart” button, but it’s greyed out for now. So in the mean time though, we can do nothing more than stare and drool over the page as we wait for its inevitable release.